Healthcare reform will be one of the top issues of the 2008 presidential election. In the face of widespread public demand for changes in the U.S. health care system, both Barack Obama and John McCain have offered detailed proposals for reform. Senator Obama's approach relies heavily on government mandates, regulations, and subsidies. He would mandate that employers provide health care coverage for their workers and that parents purchase health insurance for their children. He would significantly increase regulation of the insurance industry, establishing a standard minimum benefits package, and requiring insurers to accept all applicants regardless of their health. He would offer a variety of new and expanded subsidies to middle- and low-income Americans. In contrast, John McCain emphasizes consumer choice and greater competition in the health care industry. He would move away from our current employment-based insurance system by replacing the current tax exclusion for employer-provided insurance with a refundable tax credit for individuals. At the same time he would sharply deregulate the insurance industry to increase competition. 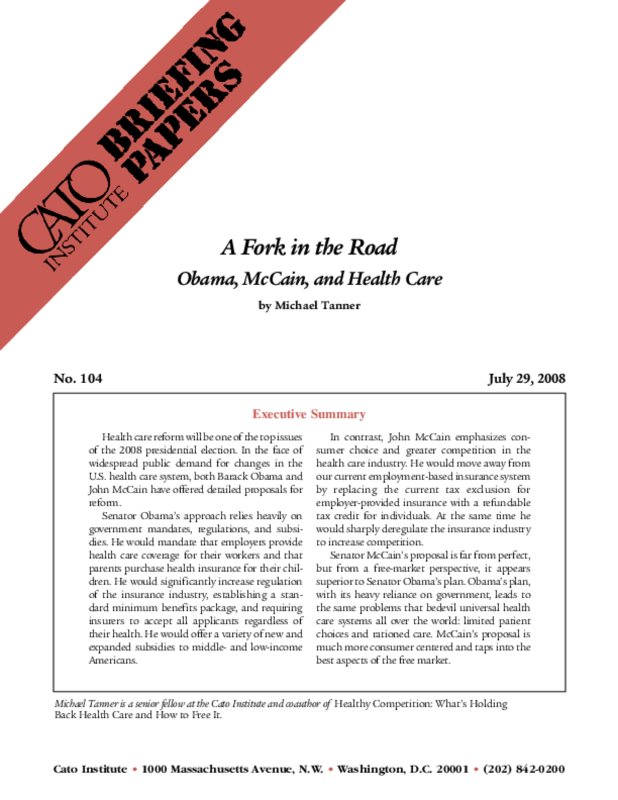 Senator McCain's proposal is far from perfect, but from a free-market perspective, it appears superior to Senator Obama's plan. Obama's plan, with its heavy reliance on government, leads to the same problems that bedevil universal health care systems all over the world: limited patient choices and rationed care. McCain's proposal is much more consumer centered and taps into the best aspects of the free market.